Usually we associate the Precision Agriculture (PA) practice with a lot of technology, however, we must say to you that knowing something about phytosociology gives you the ability to start practicing PA. Any farmer worthy of this name, when he sees different types of weeds in different parts of the parcel, knows immediately that, for example, the soil pH, or the clay content, or the water table level are different in these places and with this knowledge can begin to treat differently what is different, thus exercising the PA philosophical principle. So, why do we need technology for? It’s always a matter of quick sampling, almost real-time processing and modeling of large volumes of information, quantifying resources application and evaluating all the comparable iterations from an agronomic point of view. In short, without technology my resolution (space, time…) is coarser and with calibrated technology such resolution can be immensely larger, expanding my ability and performance in the decision making process. Technologically more intensive processes usually require a higher level of training and in Precision Agriculture we need trained people capable of articulating / exercising the following knowledge (skills): i) Agronomy; ii) Technology; iii) Economy / Management; and iv) Environment. If we look at the following picture we immediately realize the relative importance of each component in the digital agriculture ecosystem. 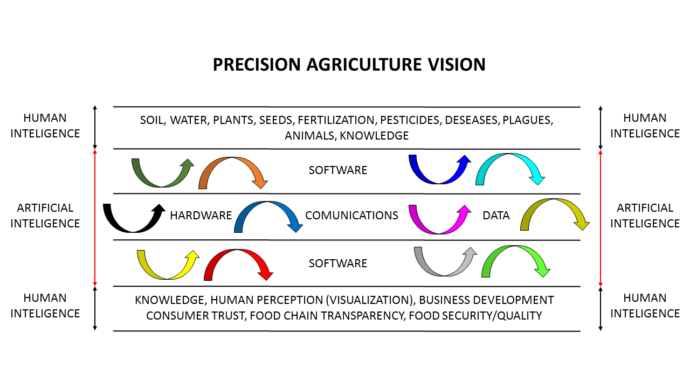 On the north side of the picture we have the agriculture parcels, where we have to sample and actuate; on the south side we have the human being, to whom we have to sell creating social value (economic and environmental); and in the middle, we have the hardware, the communications and the data, that are served upstream and downstream by the software. In this digital ecosystem, two types of intelligence, human and artificial, will surely be important, the first to interpret and frame societal problems, and the second as a way of processing large volumes of information in almost real time, unable to be processed by human intelligence. What are your skills in this Agro-digital world? If, in view of the previous, you consider that they are low, invest on your agro-digital literacy.